Sokala Villas is a romantic adults only (18+) honeymoon getaway. 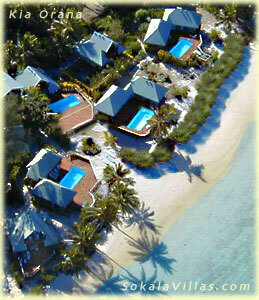 It is a small absolute beachfront property on beautiful Muri Beach on the Polynesian island of Rarotonga, Cook Islands. The 6 villas come with their own facilities and 4 with own swimming pools. You will be just a few steps from the tranquil turquoise lagoon where you can snorkel by day and relax with a drink at sunset. Consider Sokala if you are looking for a beachfront holiday villa for your honeymoon,	anniversary or a special tropical island getaway!